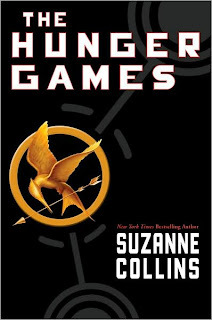 I started Suzanne Collins's The Hunger Games Monday morning. I cracked that little guy open - an oh-so-perfectly squat, sturdy hardcover - on the Q train platform, and was completely hooked by the time I arrived in midtown. I flew through the pages during my return to Brooklyn, impatiently finished my freelance work, and then leapt into bed to find out what happens to Katniss. It's been a long while since I've had a book that makes me scurry to the train, and I'm heartbroken now that I'm finished with Book One. (Yes, in less than 36 hours. Yes, I went to work.) I just couldn't put that chubby little book down, and I'm ashamed I didn't pick up the series sooner - what's not to love about a book that's a little 1984, a little Shirley Jackson's "The Lottery," a little Stephen King's "The Long Walk"? To some, I know the fervor with which people love these YA-crossover novels seems a bit...odd. After all, don't we have an overwhelming number of novels available for grownups? Aren't there enough adult stories to be devoured and loved? I'd answer that with a resounding yes, but I'd also say that kind of misses the point. Rarely does an adult novel read like Harry Potter or Twilight - a story intended for adults can be well-paced and exciting, of course, but it doesn't seem to breathlessly gallop across the pages like a YA novel does. I read these crossover novels with my fists clenched, holding my breath and cheering on the protagonists. Adult novels can stir great emotion, but YA novels bring me right back to my teenage years and the uncontrollable, buzzing energy of that age. I don't want to just feel when I read these. I want to shout at the pages, hoot with happiness and howl with rage as the occasion requires. For a few hundred pages, I remember what it's like to read without a lit criticism class swirling in my head, without 16 years of experience telling me how the real world works, without having a perspective that's already pretty formed and solidly reinforced by life. I remember how it feels to read for the pure joy of reading - not because you should check out more works in translation or "Gosh, I never did read Anna Karenina" or some reviewer in the Times raved about the latest doorstopper tome, but because it's exciting to live someone else's life, to try on a new perspective, to visit a new where or when. Reading these novels makes me appreciate my love of reading, and reminds me why it's there in the first place. Hot damn, I can't wait to start Book Two. Your 'gallop' image is a great one! I've read two books this month: The Hunger Games and Elegance of the Hedgehog. Loved them both but The Hunger Games was so much more fun to read! Come down here and get in my book club!